The “30 laboratories for Adamed’s 30th anniversary” contest is over! Science is not boring at all and scientific topics may be presented in a creative, out-of-the-box manner. A competition entitled “30 laboratories for Adamed’s 30th anniversary” that was organised by Adamed Group proved that it is true. Students from Poland competed for state-of-the-art school laboratory equipment. The great commitment of young people and a huge number of applications show that the Polish youth wants to, and is able to, learn in a modern manner. “All in all, students submitted almost 300 videos, so the competition was fierce. That is why the winners deserve even more congratulations. The creativity of students and teachers was great and the popularity of the competition made us very happy,” says Katarzyna Dubno, Director of the Department of External Relations and Health Economics at the Adamed Group. All the videos were posted online. At the first stage of the winners’ selection, an online vote was held. 150 thousand online opinions allowed for selecting the top 100 proposals. The competition jury chose the best 30 videos from among them. “The attendance and the interest in the competition went far beyond our expectations. We are particularly glad that videos sent from across the entire country were awarded in our competition and that among award-winners there are many schools located in smaller towns or villages“, emphasises Katarzyna Dubno. The list of the awarded schools may be found online at: http://adamed.com.pl/pl/30lecie/konkurs. There are links to the videos submitted for the competition, as well. This year’s competition was the second chance for state-of-the-art school laboratory equipment given by the Adamed Group to students. The 1st edition was organised last year under the auspices of ADAMED SmartUP programme. At that time, the jury selected three laureates from among 130 creative, funny and inspiring educational lessons in the area of chemistry, physics and biology. 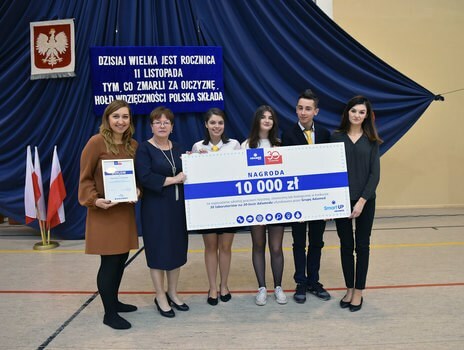 Modern laboratory equipment was awarded to high schools in Sanok, Starachowice and Mielec.